Italian foods and sauces such as shredded cheese of Sargento, Barilla pasta, Bertolli sauce, and more will be a BOGO free deal at Publix stores. 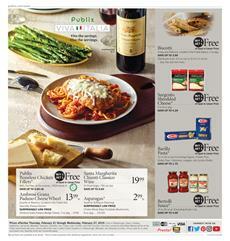 Check out Publix Weekly Ad for awesome BOGO Free deals on Italian cuisine products. Arnold premium Italian bread, Armour meatballs, Pompeian olive oil are three example deals on pg 2 where you can see the details of more Mediterranean tastes. Also, a recipe of "baked meatball parmesan with pasta" is available on pg 3. Its ingredients and an idea for wine with this fine dinner are available on pg 3. Try new things at lower costs by Publix Ads. Seafood has always been a major category in all ads. This week again, you have alternatives to buy goods from the sea at lower costs. Salmon select cuts, ground chuck, Buitoni pasta, extra large white shrimp, Aprons country chicken skillet meal kit are available in the range of new meat and seafood category on the ad. Publix also matches Premium quality meat with great side dishes. Rana skillet gnocchi is a low-price deal. Pay only $3 for 2 12 oz. pkg. Also, see the Greenwise products on pg 5. Vegans can also find great products at Publix stores. Vegetable mixes, carrots, white onions, potatoes and fresh fruits are available in the new sale. Cantaloupe chunks and salad blend are two BOGO Free deals. Publix offers grocery delivery, too. Check out their online page for the delivery service, prices and grocery range. 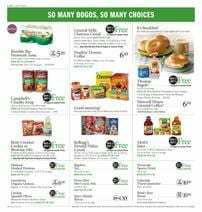 There are BOGO deals still valid on the latest Publix Weekly Ad. Weekly food supplies, breakfast, snacks, soda packs, coffee, water packs, and more are possible to find. Also, multiple buy deals like 2 for $4 deals are available. For example, 4Grain brown eggs will cost $4 for 2. Shop quick and simple meals like Newman's Own pizza with these BOGO Free deals. Nabisco Triscuit crackers are one of the multiple buy deals. Pay $5 when you buy 2 of them. Browse this Publix Ad for non-food products, too. Personal care sale including dental products, high-quality beauty items, popular brands and a wide product range which is a promotion of the actual sale in-store and online. You can find half prices on Ocean Blue professional dietary supplement. I think one of the things that make a morning great is a good breakfast. Get your nutrition properly in the mornings, have a coffee and begin a great day with peaking your productivity and efficiency. Moreover, stay in the profit zone by reducing the costs of all these things with weekly ads like that of Publix. These are only good products that are popular from the whole list. Browse the Publix Weekly Ad page for all the products within the BOGO Free range. You can easily spot these awesome savings on pg 10-12. Also, follow our Facebook page and other social media accounts to get notifications from the ads. Shop your weekly food needs at the Publix store for the prices shown on Publix Weekly Ad Feb 14 - 20! Pie, salad kits, whole subs, turkey, chicken, the finest of the meat and more grocery items are usually featured categories of the Publix Ads. You can see some of the good ones on the first page. $709 savings are available in the new ad. Kashi cereal, Eight O'Clock coffee, Publix premium salad kit and Publix bakery small pies are 4 products of BOGO Free deals. Buy boneless NY strip steaks for only $7.99/lb. Save $4 each lb. If you didn't buy any gift or want to buy something now, Publix has still offered for Valentine's Day. See the gifts including rose arrangements, holiday specialty cake, chocolates and other treats on that page. Publix has new recipes as usual. Read the new recipes of broiled salmon with asparagus and lime-butter sauce on pg 3. 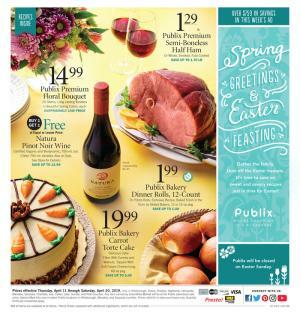 Check out more seafood, meat, and other delicious dinner or lunch ideas by Publix Ad on pg 4-5. Shrimp is one of the most popular products of all weeks in the weekly ads. Medium white shrimp is only $5.99 at Publix this week. You can also prefer GreenWise products which provide an alternative of healthy eating. More than that, pepper, salmon fish, NY steak, turkey breast and alternatives for dining can be easily seen on that part of the ad. Sweet and juicy fresh fruits, the best prices of fresh vegetables are both viewable on pg 6-7. You can save on deli subs, Italian salad, healthy snacks and sandwich varieties in deli section. Also, find fried chicken priced at $6.99 for 8 pieces. Publix has more Greenwise products in the deli and bakery. Boneless New York Strip Steaks $7.99/lb. Publix Deli Oven Roasted Turkey Breast $5.99/lb. Old El Paso Dinner Kit BOGO Free - save $1.20/lb. 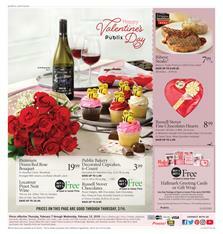 Publix prepared an elegant range of products for Valentine's Day in this ad. Chocolate box, a fine dinner, romance and all the other related things are on sale at Publix. This special sale covers amazing products that you probably fall in love with. Greenwise products like organic bars, organic chicken fillets and more can be seen on pg 2. The recipe of savory turkey meatloaf, berry salad and oat-almond crumble are readable on pg 3. Publix also offers ingredients of these recipes at a lower price. Find dinner ideas, too. Small lobster tails, lean ground beef, salmon select cuts, aprons garlic herb chicken meal kit, premium mussels, and more will cost less this week. The deals are effective starting on February 7. You have a special range of meat, too. Check out boneless top sirloin steaks priced at $4.99 lb. Another one is Southern belle lobster mac & cheese priced at $8.99! Valentine's Day floral bouquet is only $14.99 at Publix. This week you can buy elegant fruits like red grapes, mandarins for cheaper prices. Publix fresh produce sale is one of the most popular categories. Check out deli products like whole subs, southern cobb salad, New York style pita chips, Publix Deli imported French brie cheese on pg 8. Boar's Head® EverRoast Roasted Chicken Breast* $8.99/lb. 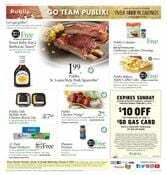 Spend your time wisely with the quality food and great deals by Publix Weekly Ad. Over $860 in savings can be found in this ad. Shop publix chicken wings, planters peanuts, Publix deli buffalo style chicken breast dip, Publix coleslaw, cubanitos platter, and more products on pg 1-2. Get $10 off on Publix platters this week. To get that discount, when you buy 3 participating Pepsico products. Publix Ad is full of great deals and recipes. One of the recipes is Buffalo ring sliders on pg 3. Read the recipe and find the ingredients at fair prices of the Publix. Wholly Guacamole is a BOGO Free deal! Publix Medium shrimp platter, ground chuck, 12-pack new Belgium beer, Colossal white shrimp, and more products can be purchased on pg 4. Meat products are also a good part of the ad. Don't miss out Steakhouse Elite ground beef burgers, Porterhouse or T-bone steaks in the meat range. Publix Weekly Ad fresh produce category is a great offer, too. Publix pineapple chunks, Del Monte Gold ripe pineapple, Navel oranges are the fresh fruits and they are all at the best prices. Visit pg 8-9 for delicious bakery and deli products. Get your munchies ready for the party and get them at Publix.